A case involving alleged False Claims Act violations and Pennsylvania precaster Universal Concrete Products Corp. is drawing to a close in U.S. District Court for the Eastern District of Virginia, Alexandria. It unfolded over three years from claims of an ex-quality control technician-turned-whistleblower who is now on track to share in “recoveries” from his former employer and colleagues. 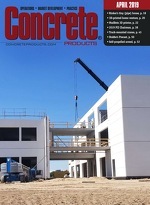 Through an agreement with the U.S. Attorney’s Office for the Eastern District of Virginia, Universal Concrete and Donald Faust, Jr., president and co-owner, will pay $1 million to settle allegations that the producer was party to submission of falsified precast panel mix test records under a Dulles Metrorail Project Phase II contract in northern Virginia. The producer held a $6 million contract with Capitol Rail Constructors, a joint venture of Clark Construction and Kiewit Infrastructure South, to fabricate 1,500-plus precast panels for Phase II, or Silver Line Extension, rail stations. The contract stipulated air contents of 4.5 percent to 7.5 percent for the panel mixes, per Precast/Prestressed Concrete Institute guidelines of 6 percent ± 1.5 percent entrained air. Court documents contend some panels were fabricated with mixes measured at air content below 4 percent. On behalf of the U.S. Department of Transportation, which administered Silver Line Extension project funds, and the Commonwealth of Virginia, the U.S. Attorney for the Eastern District of Virginia filed a civil complaint alleging False Claims Act violations by Universal Concrete and former Quality Control Manager Andrew Nolan. The latter pleaded guilty in August 2018 to conspiracy to commit wire fraud, a charge connected to falsifying air content measurements for Silver Line precast panel mixes. Whistleblower Nathan Davidheiser, a former Universal Concrete quality control employee, reportedly observed Nolan altering air test records to reflect contract compliance. His 2016 suit was filed in U.S. District Court under False Claims Act and Virginia Fraud Against Taxpayers Act provisions that allow private individuals to sue on behalf of the government. Settlement of his case will factor into a Department of Justice revenue center, which for fiscal 2018 cited $2 billion-plus in False Claims Act recoveries. The Act is the government’s primary civil remedy to redress false claims for federal funds and property involving a multitude of operations and contracts, the Justice Department notes. Congress strengthened the law in 1986 by increasing incentives for whistleblowers to file lawsuits alleging false claims on behalf of the government. Dubbed qui tam, whistleblower actions like those of Nathan Davidheiser represent a significant percentage of False Claims cases. Under 1986 revisions, a whistleblower can receive up to 30 percent of a case recovery—not bad for a precast plant quality control staffer. Concrete quality control technology is approaching an era of automated test result reporting, as indicated in this month’s ForneyVault review (page 54). Agencies and contractors adopting this and future tools will make it more difficult for quality control managers to stretch concrete mix or specimen parameters to which they are bound. Technology might just reign in instances of manager fudging and employee finking. Lean Six Sigma Value—Is the Concrete Industry ready for it?